Help create opportunities for women entrepreneurs in global trade! The WVEF Tech Challenge aims to help corporations identify women-owned businesses (WOBs) around the world – including in developing countries – to include these in their supply chains. As part of this year’s Women Vendors’ Forum and Exhibition (WVEF), the International Trade Centre (ITC) has teamed up with Google and CI&T to launch an electronic platform on which women-owned enterprises (WOBs) can register their businesses and increase their visibility to potential partners. At WVEF, which will be held in São Paulo, Brazil, on 2-3 September 2015, ITC and partners will also launch a call to action to support 1 million WOBs enter international markets by 2020. And your technology solution could help realize this goal. Application for the WVEF Tech Challenge 2015 are now closed! The finalists will be invited to present their ideas at WVEF 2015 September 2-3 in São Paulo, Brazil, where the winning project will be also be announced. - On September 2-3, at the WVEF 2015 interactive exhibition area: dynamic promotion of the best prototypes for the WVEF Tech Challenge 2015! * The International Trade Centre is a joint agency of the World Trade Organization and the United Nations, acting as the development partner for small business export success. 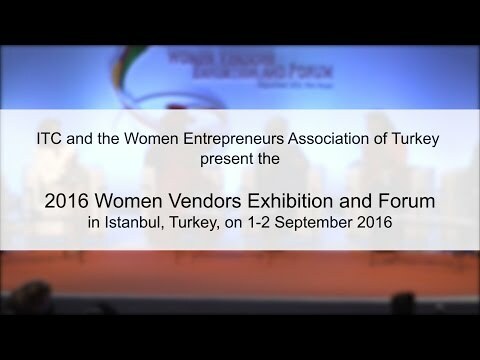 * Women Vendors Exhibition and Forum (WVEF) is a premier business event that links women vendors to markets by providing training, improving skills and facilitating meetings with buyers. WVEF is held this year in São Paulo, Brazil, with the Brazilian Trade and Investment Promotion Agency, Apex-Brasil.